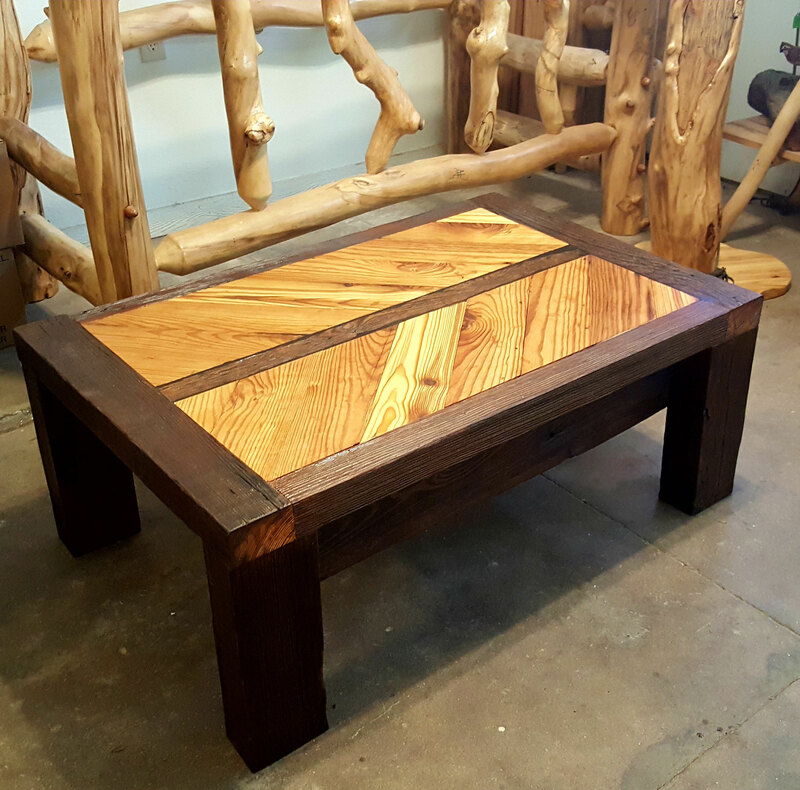 This rustic, reclaimed wood coffee table was hand crafted using old growth yellow pine that we salvaged from a 100+ year old Southwest Oklahoma mill. It measures 45"x30"x18" (LxWxH). All of the wood has been carefully cleaned with a wire brush to smooth while altering the wood as little as possible. 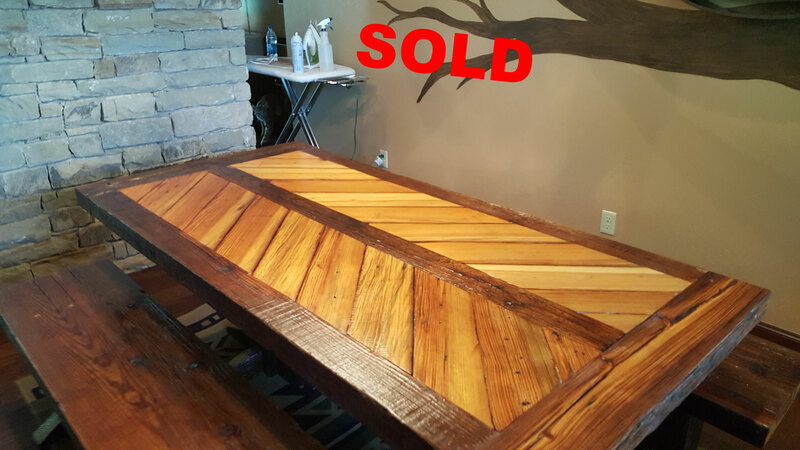 It is then oiled with a neutral oil to bring out the color and protect it before being coated with an antique flat polyurethane finish. 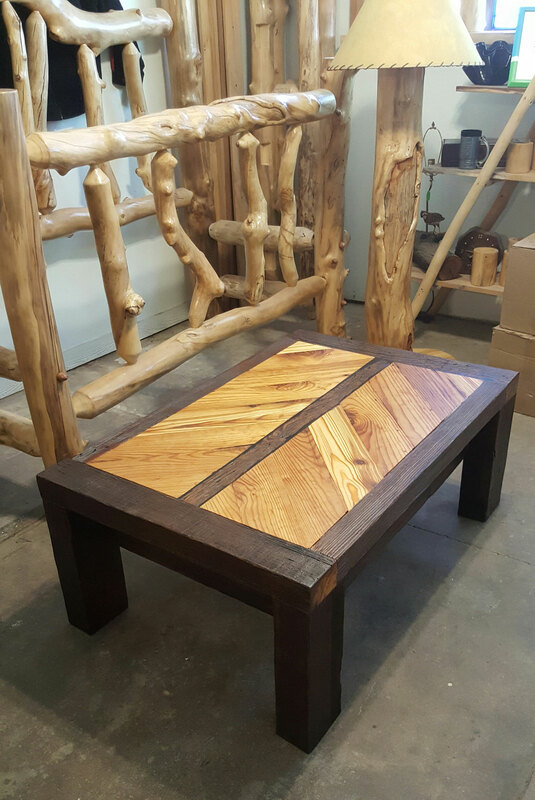 The base was secured with mortise & tenon joints and the inlay was secured with tongue & groove joints. 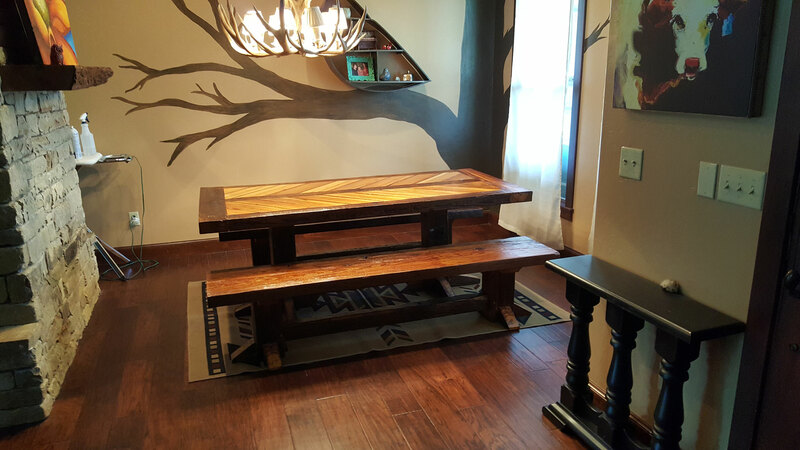 A black epoxy was used to fill any low places and blend with the wood. All joints were pinned and/or glued with a high strength commercial wood glue. 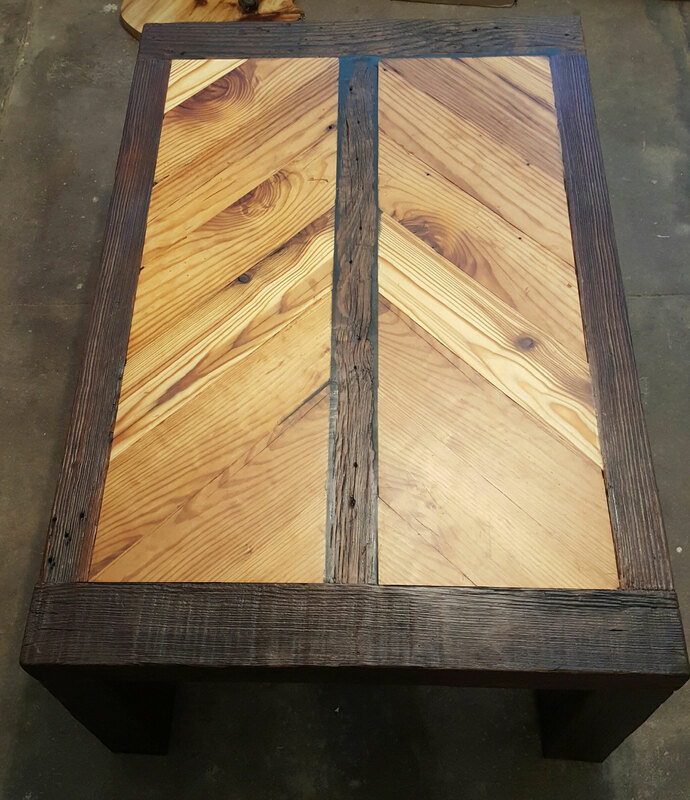 The chevron inlay is the same wood as the base, just planed down to get the color variations. 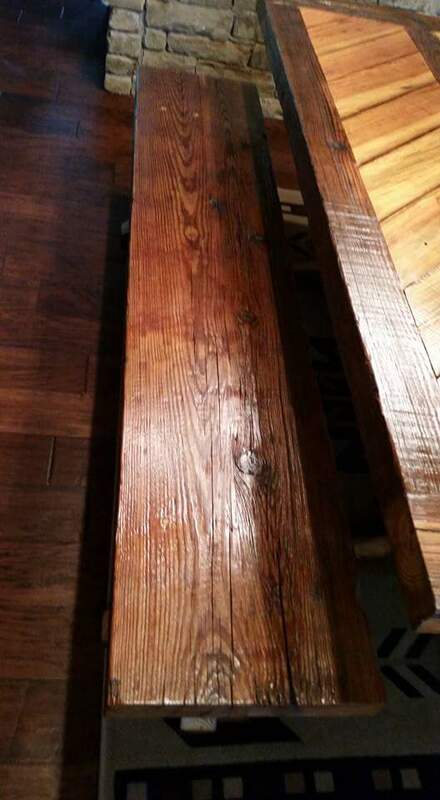 Any natural drying splits in this wood have been there for years and do not affect the integrity of the table. This table is extremely sturdy and built to last. Custom orders are welcome! This is just one example of what we can do - there are a number of variations . If you have something different in mind, please contact us with your ideas and/or dimensions. 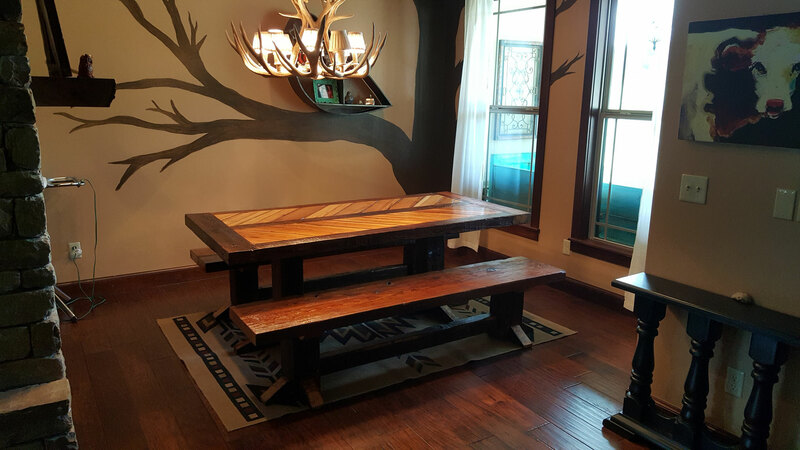 This rustic, reclaimed wood dining table and benches were hand crafted using old growth yellow pine that we salvaged from a 100+ year old Southwest Oklahoma mill. The table measures 80"x38"x30" (LxWxH) and the benches measure 80"x16"x18" each. The base was secured with mortise & tenon joints and the inlay was secured with tongue & groove joints. Epoxy was used to fill any low places and blend with the wood. All joints were pinned and/or glued with a high strength commercial wood glue.